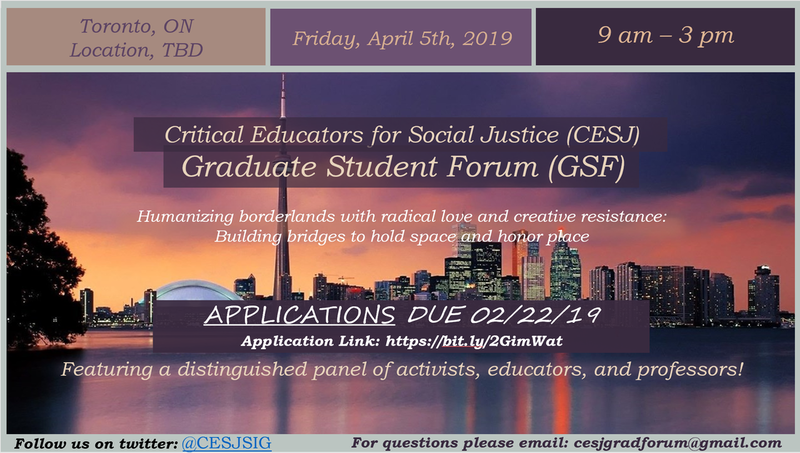 The Critical Educators for Social Justice (CESJ) Special Interest Group (SIG) invites you to apply to the 11th Annual Graduate Student Forum (GSF) during the annual meeting of the American Educational Research Association (AERA) conference in Toronto, Canada. This forum is a designated session free of charge for approximately 25-30 doctoral students. The session includes a light breakfast, lunch, a panel of distinguished professors, as well as opportunities to interact with both panelists and participants. Help prepare critical scholars for future scholarship and related work. Identify strategies and tools to share and take back to our colleagues, students, communities, and home institutions. Learn from scholars and peers about the possibilities and tensions that arise in social justice and critical education research. Within our current political climate, learning how to be a critical scholar in turbulent times is more imperative than ever before. The continued efforts to dehumanize minoritized and marginalized communities necessitate charting radical paths to dismantle artificial borders between scholarship and activism by sustaining relationships with people, places, and critical counter-spaces. Educators committed to social justice praxis honor place and hold space to navigate and negotiate realms of liminality, criticality and fugitivity in the academy and beyond. In this intergenerational gathering, critical scholars and scholar-activists, or “scholactivists”, will (re)connect, (re)energize, and strive towards wellness, while building community and strategizing on how to tear down the walls that dehumanize, colonize and otherize our people, our places and planet. How can we leverage/engage/activate radical love and critical clapback to sustain relationships across borderlands in the academy and beyond? In humanizing borderlands, what strategies might doctoral students engage to tear down walls, build bridges, hold space and honor place in hostile climates? ​ a. What guiding principles or enduring insights should inform our effort? 3. In our scholactivist strivings, how do we prevent falling into the trappings of the academy? ​ a. in advocating, representing, and serving minoritized students? b. and, in producing, humanizing and decolonizing (P.H.D.) knowledge? To be considered please fill out the online application by clicking the link or enter http://bit.ly/2SoE04Z in your browser and complete by: Friday, February 22, 2019 5pm PST. The CESJ Graduate Student Forum aims to gather a diverse group of graduate students whose work and backgrounds align with CESJ’s mission and values. We hope to have representation from different universities, stages in the graduate process, research interests, ethnic/racial groups (especially underrepresented Students of Color), gender identities, sexualities, and other identities. Please direct any questions about the forum (GSF) to CESJgradforum@gmail.com. The Critical Educators for Social Justice (CESJ), a Special Interest Group (SIG) of The American Educational Research Association (AERA) invites applications for the Pre-Conference CESJ Early Career Scholars Forum to be held Friday, April 5, 2019 from 9am-3pm. The forum is designed to support early-career tenure track faculty, non-tenure track faculty, and postdoctoral scholars. During the forum, participants will gather with scholar-mentors from CESJ to discuss various topics related to research and scholarship, teaching, community-engaged scholarship, and service. Our goals are to provide early career scholars with 1) a sense of community with scholars committed to critical scholarship and social justice; 2) mentorship from a range of scholars (junior and senior level colleagues and community scholars); 3) practical tools and strategies for navigating academic and public contexts; and 4) a chance to network and build community with other CESJ early career scholars. This is the SIG’s fourth year offering this event and has been modeled after our highly successful Graduate Student Forum. The CESJ Early Career Scholar Forum will be a powerful gathering of scholars across the United States and Canada committed to producing and supporting critical scholarship and practice within education. The forum will include time with panelists, informal large group activities and interactive small group discussions. Refreshments will be provided. Our goal is to create a space that is both communal and intimate by providing many opportunities for interaction between participants and between participants and panelists. Accepted participants will be notified by Monday, March 4, 2019. Please contact Nini Hayes (nini.hayes@wwu.edu) or Oscar Navarro (osnavarr@calpoly.edu) for additional information and/or if you require assistance with the application process. A significant objective of CESJ is to promote communication and collaboration among critical educators and researchers working in public schools, universities, and community education programs. We believe that education, as a form of critical understanding, plays a crucial role in transforming society; therefore, we encourage the participation of educators whose work is founded upon these principles. These attacks have been aimed at other critical scholars in the past, and we know that they will likely and unfortunately continue to happen in the future. The Critical Educators for Social Justice SIG stands in solidarity with critical scholars engaging in transformative research and scholarship. We urge university administration to support scholars engaging in critical social justice research agendas. And we urge our community to come together to support each other. We also commit to supporting our graduate students doing this work and supporting the P-20 youth who may be participants in research projects. We know that when we stand together we are stronger and more powerful in our ability to create meaningful change in education. The 2017 annual meeting of the American Educational Research Association (AERA) in San Antonio, TX is nearly here! CESJ has a lot of events and exciting sessions planned, including our pre-conference forums, business meeting and fireside chat featuring a panel of distinguished critical scholars, and a co-sponsored super SIG social. For more information about CESJ specific events, check out a special edition of our 2017 CESJ Spring newsletter below. Registration Now Open for the 2017 CESJ Graduate Student Forum "Hope and Resistance: Strategies for Social Justice Scholarship and Praxis"
1. Help prepare critical scholars for future scholarship and related work. 2. Identify strategies and tools to share and take back to our colleagues, students, communities, and home institutions. 3. Learn from scholars and peers about the possibilities and tensions that arise in social justice and critical education research. Forum Themes and Topics: "Hope and Resistance: Strategies for Social Justice Scholarship and Praxis"
While the collective struggles for educational equity, justice, and liberation are not new, our efforts towards social justice are reinvigorated in a historical moment marked by, a) the resurgence in overt manifestations of Islamophobia, racism, misogyny, ableism, nativism, and xenophobia, and the resultant increase of hate crimes on university and K-12 campuses, b) the ramped-up assault on public education through unbridled free market reforms, and c) the persistence of intersecting racialized, gendered, and classed schooling contexts that are simultaneously sanctioned and invisibilized by the state. In light of the continuing and current challenges facing the struggles for material change and educational equity, this year’s CESJ Graduate Student Forum collectively asks: What are our roles as doctoral students engaged in social justice scholarship in the struggle for collective resistance? What strategies might social justice doctoral students engage in to pursue our continued work alongside our communities in the current context? The members of the Critical Educators for Social Justice SIG are committed to teach, promote, and implement the principles of critical pedagogy in order to establish an educational movement grounded in the struggle for social and economic justice, human rights, and economic democracy. The members of CESJ are committed to cultural, linguistic, political, and economic self-determination within our classrooms, schools, and communities. b. Current participant academic status and institutional background. d. Description of what you hope to gain from your participation in the forum. The CESJ Graduate Student Forum aims to gather a diverse group of graduate students for this event whose work and backgrounds are in line with CESJ’s mission and values. We hope to have representation from many different universities, students’ years in graduate school, research interests, ethnic/racial groups (especially underrepresented Students of Color), gender identities, sexualities, among other identities present at the forum. Thank you for your interest. Please direct any questions about the Graduate Student Forum (GSF) to CESJgradforum@gmail.com. The Critical Educators for Social Justice SIG will offer a pre-conference forum for early career scholars (non-tenured). The forum is open to early-career tenure track faculty, non-tenure track faculty, and postdoctoral scholars. During the forum, participants will gather with scholar-mentors from CESJ to discuss various topics related to research and scholarship, teaching, community-engaged scholarship, and service. The purpose of the forum is to provide early career scholars with 1) a sense of community with scholars committed to critical scholarship and social justice; 2) mentorship from a range of scholars (junior and senior level colleagues); 3) practical tools and strategies for navigating academic contexts; 4) a chance to network and build community with other CESJ early career scholars. This is the SIG’s second year offering this event. The CESJ Early Career Scholar Forum will be a powerful gathering of scholars across the country committed to producing and supporting critical scholarship and practice within education. We hope you decide to join us! *Refreshments will be served throughout the seminar. Navigating and Surviving the Academy as a Social Justice Scholar Thursday, April 27, 2017, 3:00 p.m. - 6:00 p.m. Location: TBA; San Antonio, TX. *Space is limited and the deadline to register is March 3rd, 2017 at 11:59pm PST. Please note that in order to foster community, we ask you to commit to attending the full forum if you would like to participate. Space is limited and the deadline for registration is Friday, March 3rd at 11:59 p.m. (PST). Participants will be notified by email in mid-March 2017. The Critical Educators for Social Justice (CESJ) Special Interest Group (SIG) of the American Educational Research Association (AERA) is committed to the struggle for social justice, human rights and democracy in education for diverse communities. We promote research, teaching, and activism including but not limited to cultural, racial, linguistic, political, and economic self-determination within our classrooms, schools, and communities. A significant objective of CESJ is to promote communication and collaboration among critical educators and researchers working in public schools, universities, and community education programs. We believe that education, as a form of critical understanding, plays a crucial role in transforming society; therefore, we encourage the participation of educators whose work is founded upon these principles. Please direct any questions about the Early Career Scholar Forum to organizers Laura Quaynor (quaynola@lewisu.edu) or Shanta Robinson (srrobinson@uchicago.edu). Happy New Year everyone! We hope you're keeping warm and that your semester is off to a great start. We're happy to announce that our Winter 2017 newsletter is available and can be read right here! This issue features the following: a rousing letter from our SIG's co-chairs; an expansive listing of 2016 publications from our CESJ membership; inspiring stories of hope and resistance; and contact information for those interested in the application process for CESJ's 2017 Graduate Student and Early Career forums to take place at the upcoming AERA Annual Meeting in San Antonio, TX. We will publish another short newsletter about 2017 CESJ conference sessions and events. So, be on the look out for that. In the meantime, we hope you enjoy this issue of the newsletter and find it useful in both your practice and reflection. We, the Executive Board and other members of CESJ, stand in solidarity with those affected by the U.S. President’s executive order temporarily banning individuals from Libya, Somalia, Sudan, Iraq, Iran, Syria, and Yemen from entering the United States. We offer love and support to our members, friends, colleagues, and students who are impacted by this despicable order that makes us less safe, contrary to the rhetoric being used to promote this hate. It is reckless, destructive, bigoted, and short-sighted. We are exhausted by the other executive orders and actions taken this past week, including the order to authorize reviving the Keystone XL pipeline and Dakota Access pipelines, the building of a U.S.-Mexico border wall, the stripping of federal grant money to sanctuary cities, and the order to reinstate the so-called "Mexico City Policy" – a ban on federal funds to international groups that perform abortions or lobby to legalize or promote abortion to which we vociferously object and encourage our membership to remain vigilant. We pledge to work within our universities to push our institutions to offer sanctuary and support for these members of our community rather than act as agents of an administration whose orders are unethical, inhumane, and likely unconstitutional. We acknowledge that the struggles for liberation, for equity and justice are not new phenomena, and that others have made infinite contributions toward our collective victories. We fight with a renewed purpose, with collective voice and resolution, and we vow to not leave anyone behind. Our advocacy will now and always be inclusive and intersectional, “For, if they take you in the morning, they will be coming for us that night”. It's that time again! In our ongoing effort to highlight and share the scholarship of our members, we invite all members to submit a list of their 2016 publications for our Spring 2017 newsletter by filling out this form. We are also seeking nominations for our 2017 awards, as well as volunteers to serve on the awards selections committee. For more information about the awards and awards committees, please see this announcement. Welcome back! We hope everyone is settling in and off to a great start to another new school year. Our new Fall 2016 Newsletter is here and is packed full of updates about what CESJ has been up to this year. You will find information about: the new CESJ Executive Board members; the 2016 CESJ award winners; what our SIG accomplished at the 2016 AERA Annual Meeting; an important OP/ED statement from The People's Education Movement; some important tips and links on self-care; and even some cool book recommendations. You can either scroll through the newsletter displayed below or download it. The Winter 2016 Newsletter is here! Check it out for the latest updates about CESJ sponsored events for the upcoming 2016 AERA Annual Meeting. We also have a great list of the newest scholarship from your very own SIG colleagues, as well as tips for teaching social justice related to the Flint, MI water crisis, and so much more! Here's a friendly reminder that proposal submissions for AERA are due on Wednesday, July 22nd. We encourage you to submit ideas for papers, roundtables, poster sessions, symposia, etc. related to the meeting theme, Public Scholarship to Educate Diverse Democracies as well as to our SIG's mission. We invite scholars from all divisions and SIGs to submit proposals. As a reminder, paper and session submissions must not identify the author(s) in any way. Proposals for papers, posters, roundtables, and symposia/sessions are encouraged, and innovative session designs are welcomed. In order to accommodate flexibility in program decisions, please select all of the formats in which you would be willing to present your work. Keep in mind that the number of proposals and the size of our active membership determine the number of sessions allocated to each SIG. Please consider our SIG as a place to share your work, and renew your SIG membership when you submit your proposals. Encourage students and colleagues to join our SIG too! All information about the annual meeting can be found at www.aera.net. Click here to find out how to get involved in the SIG. Click here to find out about the SIG's past work. Click here for information about "The Scholactivist" blog featuring a member spotlight and short essay written by a SIG member each month. If you would like to nominate someone to be highlighted (or would like to self-nominate), please email Communications Co-Chair Bianca Baldridge at bbaldridge@wisc.edu.